This book gives voice to the struggles of people of color. Starr's voice speaks louder than words on the page as you get sucked into this story that is a rush of reality. Comprised of friendships, family, and the belief in her the strength of her voice, Starr brings a YA take on racism and racial issues. Listening to the audiobook brings this experience to a whole new level. A new dimension, really. Don't miss Bahni Turpin reading this! This is such an important book. It should be required reading for life in general. Or listening. Definitely listening. 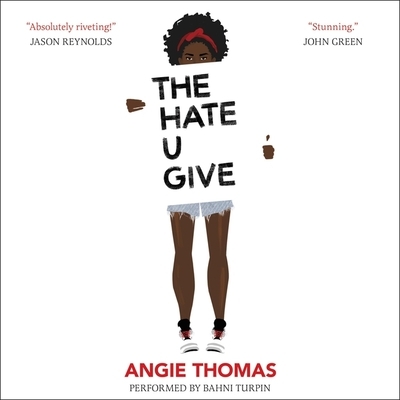 The Hate U Give portrays the shocking reality of police brutality and racism in America. Many people only see what the media portrays. This book however, shows us the other side, through Starr Carter, who witnessed her unarmed black friend get shot by a white police officer. Throughout the book, Starr tries to find her voice to defend and speak the truth about Khalil. It was amazing to see the other sides and the struggles of the minorities in America, that I would never see.